I just got around to read the piece in March’s The Atlantic in which the authors, Nicole Allan and Derek Thompson reported on the myth of the college loan crisis and try to justify the the 150 percent rise in college costs since 1995 and the 300 percent jump in college loan debt since 2003. The authors happily report that the investment in higher education is perfectly acceptable, based on their data which is totally thrown off by students who attend schools such as Harvard or Yale. It seems these students leave with less debt and get higher returns than students attending less prestigious schools. Who would have guessed, the system works best for the elite among us? But this tiny percent of students is enough to through off educational data regarding the cost to value ratio of college. What the authors fail to point out is that the cost of a bachelor’s degree rose much faster than inflation last year while its average value fell. This has happened EVERY YEAR this century. If it doesn’t send off alarm bells in the middle class, it should. For many jobs today, even clerks and administrative assistants, a BA is a requirement, and the cost of that BA far exceeds the value of the job compensation the college graduate will obtain. Further, many college students are being driven out of college before they can finish because of the costs. For middle class families, it’s no longer a matter of starting to save for college when your child is born. Many families do that. The fact is, most families cannot save enough to keep up with the rate of college costs. As a result, those kids who do graduate, frequently do so in debt, even if they go to public universities. Maybe the next time you go on a college tour and oh and ah over the beautiful dorms and fine athletic facilities, you should tally up what those facilities add to your bill. Unless your child is getting a full ride to Harvard, look for schools that offer full time-professors and excellent program offerings in the field your child wants to pursue. Your child really doesn’t need a suite that rivals a penthouse in Manhattan and a climbing wall to succeed. That college degree is important, but graduating with crushing debt is a terrible price to pay for it. It’s now April, and kids have received those fat envelopes or e-mails (no more thin envelopes) telling them where they’ve been accepted or not. My youngest daughter had the good fortune to be accepted at her first choice school way back at the beginning of February. She just didn’t share it with me until recently. My daughter has always been a bit unconventional, so naturally she opted for an out of the box school–University College Dublin, as in Ireland. At first I was really kind of floored. My daughter has always been the closest to home of my three kids. She was bullied so badly in her first school that we pulled her out and put her in a Quaker school. It was a great experience for her, but she’s still had her ups and down. She has ADHD; she’s always had to work like a demon. It hasn’t stopped her. But i always figured when it came to college, she’d want to stay closer to home. I was wrong. My little bird has grown some mighty wings, and she wants to stretch them. She was accepted as a double honors major and plans to go for English with Drama and Archeology (a very unusual combination). In three years, she’ll have her degree, and maybe she’ll just stay on to get a masters. The tuition is quite reasonable, and though it’s far away, it’s really not much worse than traveling to California. I still worry, but I know she’s gone through many challenges and triumphed largely due to her own moxie and talent. On top of that, she’s still a good and decent person. I guess it’s time to push her out of the nest and let her fly. 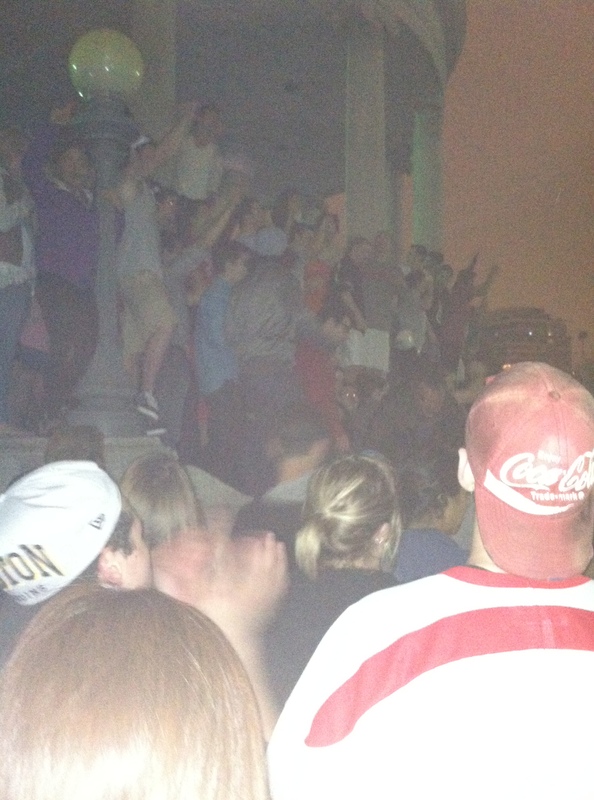 Last night after police caught Dzhokhar Tsarnaev, the second suspect in the Boston Marathon bombing, my son sent me this photo of college students pouring out into the streets of Boston to cheer the police and government personnel who aided in the capture of this 19-year old young man. Boston, Cambridge and the surrounding area had been held hostage, its streets empty, the T shut down, while a house-to-house search was conducted in neighboring Watertown. Tsarvaev was found wounded, hiding in a boat in in a back yard in that little community. The house was just beyond the search area. Much has been made of the Justice Department’s decision not to immediate read Tsarnaev his Miranda rights, and that will in the coming days be a matter for debate among lawyers, lawmakers, political activists, and pundits from the left and right. For now, as a mother of a kid who but for a research paper might have been at the Marathon and as a fellow human, I extend deepest sympathies to the families of the killed and wounded. I’m also joining in with the celebration of the people of Boston. Maybe shutting down the city was a bit of overkill, but in the end, the good guys won. I’ve just signed up for the Story A Day challenge in which you must write a short story every day in May. I don’t know how many people are familiar with StoryADay but it’s run by a lovely woman named Julie Duffy who believes that writers need to put aside excuses for not writing and just do it. If you keep just doing it, it will become second nature. That sounds reasonable to me. In any case, I love a good challenge. So, 31 short stories in May. Don’t know if I can do it, but I intend to try. Anyone out there who wants to try should look up StoryADay.org and give it a whirl. Today the U.S. Senate voted 68 to 31 to end the Republican filibuster of the gun control bill. This means that finally the bill can be debated on the Senate floor. The vote came after the families of the victims of the Sandy Hook massacre traveled to Washington to personally lobby members of the Senate to listen to their concerns and at least discuss gun control measures. Tighter gun control is something overwhelmingly favored by Americans in poll after poll, but that isn’t really the point. Has gun control become an issue so delicate that it can no longer be discussed? You can argue that tighter gun control laws wouldn’t have prevented the Sandy Hook massacre, and that might be true. But the Republican filibuster wasn’t about stopping a gun control law, it was about stopping any discussion of a gun control law. That’s just wrong. So congratulations to the 16 Republicans who crossed the aisle to vote with the Democrats and shame on the 29 Republicans and 2 Democrats who voted against just debating the gun control bill. The families of the Sandy Hook victims and the families of all gun violence victims deserve that debate. Lately I’ve become intrigued with short stories and flash fiction, something I haven’t done much with since college. I find myself reaching back into the deep recesses of my life and pulling some dark memories then reshaping them into stories. I know our lives shape our writing, but it never occurred to me until I started looking at these stories that writing really is like slicing open a vein and allowing the blood (sometimes poison) to spill out. It can be unnerving at times, but also energizing. Maybe that’s why so many writers are alcoholic or otherwise troubled by demons? Just a thought. The Family That Writes Together . . .
At the urging of two of my children, I’m beginning a new project: a fantasy novel, which represents uncharted territory for me. I’ve written a thriller that I’m trying to get published and teaching myself flash fiction, just because it seems like a great genre, but fantasy represents a whole new challenge. In fact it is a bigger challenge than I ever anticipated. I’ve never built a world before. I have to know the characters, so I’ve started drawing them. My daughter is advising me on magical creatures. My son is advising me on military strategy and feudal government. I’m drawing maps, so that I can eventually lay everything out and go into that world, at least figuratively. The best part is that in the end, this will become a sort of family project. I don’t think I have ever created a book by committee, but so far I’m liking it. If I can only keep up with my kids as they spit out ideas, we may get the story put together. We’re developing a plot with many sticky notes, lots of drawing paper, and colored pencils. When we do get our book finished, I will put it out there as a collaboration. I’m feeling very psyched.